Rosewood or black piano finish wood plaque with an acrylic plate floating 1/4" above the surface. 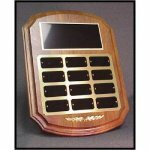 Plaque has a felt back and can be displayed on the wall or on a desk. 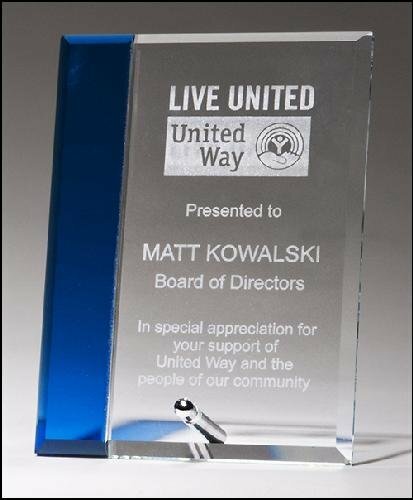 Your text/graphic laser engraves a frosted white. Individually boxed. 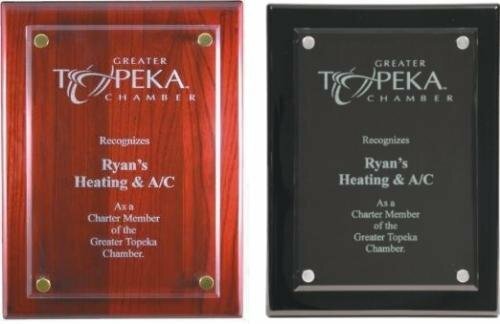 Rosewood - 8" x 10"
Rosewood - 9" x 12"
Black - 9" x 12"
Rosewood - 10 1/2" x 13"
Black - 10 1/2" x 13"
Clear glass award with sapphire blue highlight on the side. 3/8" thick glass with silvertone post at bottom for standing. Your text is laser engraved in frosted white. Individually boxed. 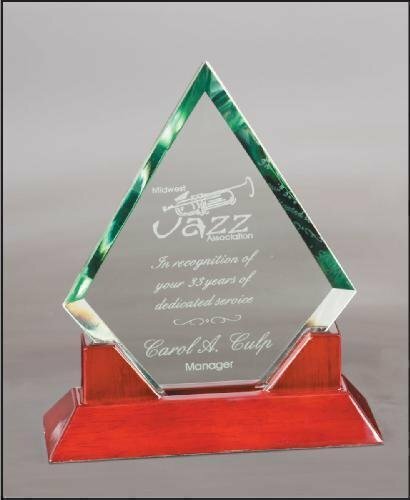 This high quality multi-plate plaque will stand out at your next monthly awards ceremony. It includes 12 monthly plates on a solid walnut plaque. Individually boxed. Plates are 1"x2"
Small individual plates returned for engraving later are billed at that time. 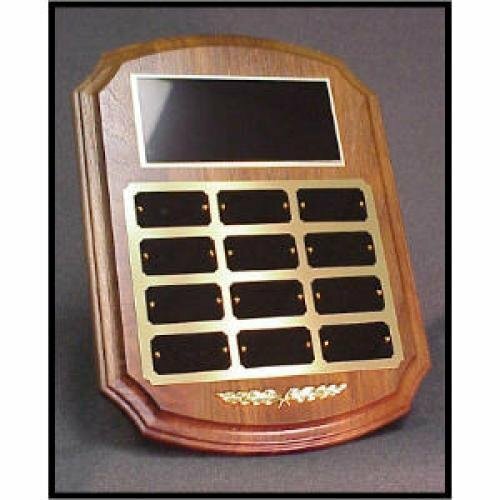 For reference, our current price for engraving these returned plates is $5.00 each. That price includes up to 6 words. 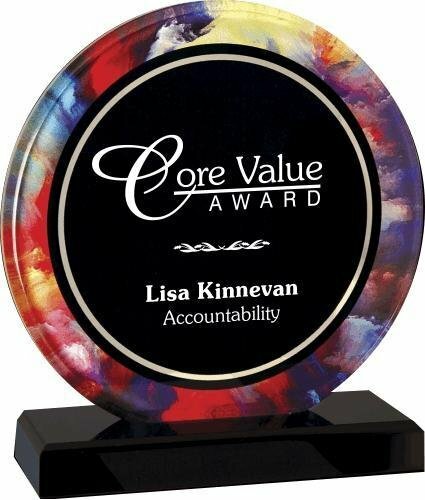 Accomplishments are elegantly framed within this cast metal frame mounted on a solid walnut plaque. Black metal plate is lasered with gold colored engraving. 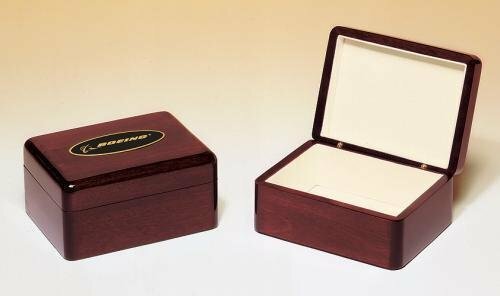 An elegant wood jewelry box with a rosewood piano finish. Beige felt lining. Laser engraved plate affixed to top of box. Individually gift boxed.